“Isn’t it funny how you can start something and it just keeps growing. That is what happened for me with these frog pins. One year my chapter was having a pin exchange and I came up with the idea to make these frog pins. I called them my Jump 4 Joy frogs, because my frogs were so happy that they wanted to jump for joy. As I thought about them I thought it would be fun to give them names. Fun names like “Cute Carol”, “Awesome Al”, “Sweet Sarah”, etc. Every one loved them and selected them because of their names.I then was helping our local Habitat for Humanity with an art auction fundraiser. 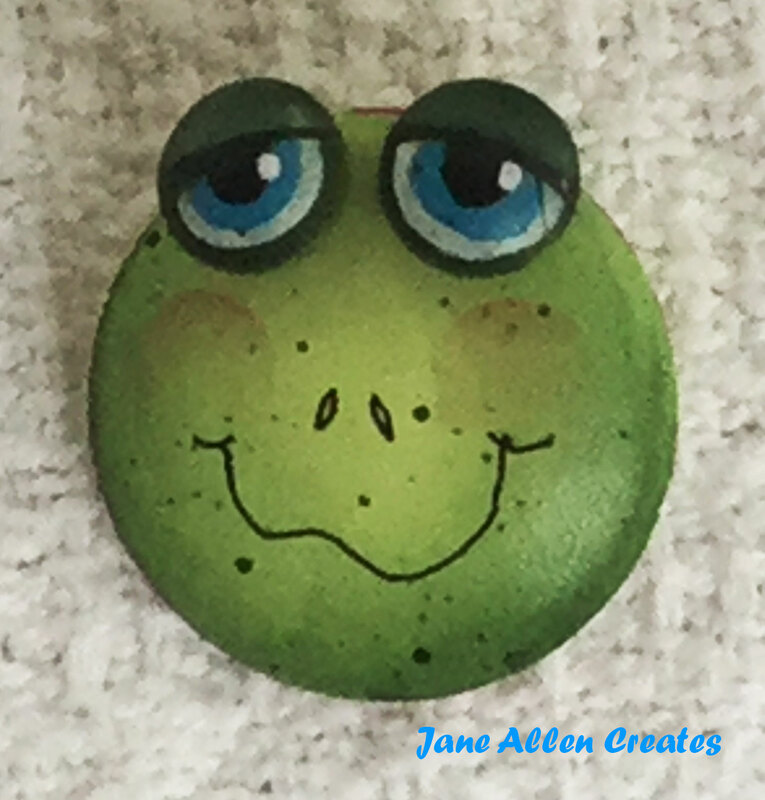 As part of the auction I decided to bring my frog pins and this time I added adoption certificates…now you could give a frog a “home” by adopting them. There was a $10 adoption fee that went to Habitat for Humanity and my little frogs were so happy to get a home that they were jumping for joy. I think we made more giving my froggie kids homes than we did on the art auction. And of course all my kids continued to have happy names like “Hoppy Herman”, “Joyful Jane”, and “Merry Mandy”. After that my church was raising money for a mission project in Africa. So I brought out my frogs again and this time I called them Leap of Faith frogs. Again you could adopt them. I continued with my happy upbeat names but also added some other names like “Faithful Fred”, “Merciful Mike”, and “Preaching Peter”. Again we adopted out many of our froggie kids and the ones that didn’t get adopted went on the mission trip to Africa and were given homes there. I thought you might enjoy making my froggie kids for a fundraiser that you are involved in. Or maybe you would like to make a few just to spread a little joy. More than once I had a froggie pin on when someone would comment on it. It gave me great pleasure to just take it off and give it to them. If I ran into them again they always had a little story to tell me about what there little frog was up to and always called them by name. For each pin you will need (2) 5/16″ mushroom button plugs #2287 and (1) 1 1/4″ dome #1823. These are available from Bear with Us, Inc. You will also need a 3/4″ pin back, multi-purpose glue and the following DecoArt Americana paints: Evergreen, Lemonade, Soft Black, Spice Pink, Turquoise Blue, and Warm White. A little trick my friend Darlene taught me when painting small pieces is to use double stick tape and place them on a piece of cardboard. I now save all the heavy cardboard backs on my different papers and palettes. Basecoat the domes with Lemonade and the eyeball button plugs with a wash of Evergreen. Float Warm White on the bottom of each plug, then do a smaller float of Turquoise, finish with a smaller float of Soft Black. Float around the edges of the dome with Evergreen. Glue the eyes to the domes. I used white glue, but if I was doing it over I would try Super Glue. Float across the top of each eye with Evergreen to form eyelid. Paint Warm White highlight in each eye and float on Spice Pink cheeks. Paint a Soft Black line across the eyelid and a few lashes on each side, if desired you can use a Micron pen to do this step. Using 01 Black Micron pen, draw on nostrils and mouth. If the eyelids seem too dark, float Lemonade against top of black line on lid. Flyspeck with Evergreen. I like to keep a Q-tip handy to wipe off any unwanted spatters. Now to make them boys and girls. (I know you were wondering) Using a #2 shader paint Spice Pink checks around the edges of the girls and Turquoise Blue checks on the boys. After putting the checks on I place them back on the board and spray varnish them. I do not varnish the back to make it easier to write on them. On the back I put the name of the project – Jump 4 Joy, my name and then the individual frog names. I then used multipurpose glue to add the pin back. I would love to hear from you, especially if you use these froggie kids for a fundraiser. I hope they will bless you and many others. PS. On the original certificates I put who the proceeds would benefit. I edited my certificates so that you could use them. You will notice there is a Jump4Joy certificate for both boys and girls and just one for Leap of Faith. Here is a link to the Adoption Certificates. I am leaping for joy! I always loved these….I remember first seeing them and hearing the story at MAD DP Conference….just about the time I was blessed with your friendship! Fun post!…PS…and Artsy Amy! Thank you Amy, I thought you would like Artsy Amy. REmind me to give her to you, she keeps getting in my paints. 🙂 …..I am sure the paint is pink ! How did you know,I think she has good taste! I love them!!! They do look Happy!!! Thankyou Robin, I smile when I look at there cute little faces. Adorable! What a cute idea for church and other fund raisers. Thank you for sharing the certificates and paint tutorials! Thank you Marilyn, I hope they bless many.